Both New Hampshire and Vermont provide some of the best places in the country to enjoy the outdoors. The NH Parks & Recreation Dept. and the VT Forests, Parks and Recreation Dept. 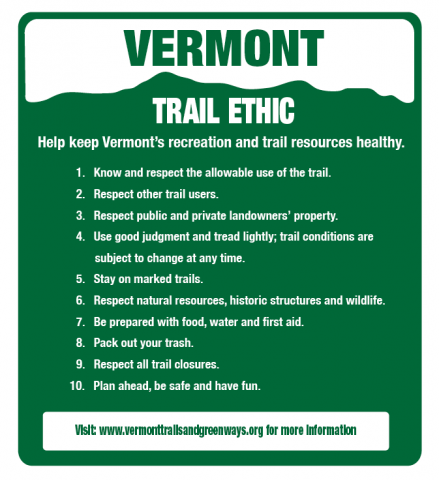 encourage the following general trail etiquette guidelines so everyone can equally enjoy time outside while sharing the many trail networks in the region. Many trails listed in Trail Finder are located on private property. This is made possible thanks to the generosity of landowners allowing for the public enjoyment of portions of their private lands for your recreation. The owner and/or their designated caretakers generally determine the allowed uses on their property. Respect for the landowner's goals, will certainly be a great step in keeping the private land open for our continued usage in the future. For all those interested in helping to provide trail maintenance support on trails you have chosen to visit, the landowner and / or the designated maintainer organization should be contacted prior to any work being attempted. Trail groups and landowner's are likely to have specific procedures or standards they'd like to be applied when caring for their trails. It's great to have volunteer support, just check-in with the trail manager or landowner first... they'll truly appreciate being informed of your interest to help out. Before heading out on a trail, check the hunting schedules, and consider wearing blaze orange during your outdoor activities. While this bright color is no guarantee for your safety, blaze orange is engineered to be visible in all but the thickest of woods and has become known as "safety orange" or "hunter orange." When possible, respect the New England tradition of hunting by avoiding trail outings during peak hunting times such as opening day. Fall is typically the busiest hunting period, especially during rifle season for deer. Be prepared to share and enjoy the great outdoors during hunting seasons by making yourself, buddies, and canine friends obvious in the woods by dawning blaze orange. Daypack Tips... What's In Your Daypack? Whenever you are getting ready for a trek in the woods, it is recommended that you carry the so-called ten “essentials.” Your ten may be different from my ten, depending on where you are hiking, with whom, the time of year and, of course, how much chocolate you are willing to carry. My personal “ten” is more like twenty-something. Whatever you end up bringing for your “ten,” try to bring items that serve double-duty. Here are some tips and an explanation of some of the things in my pack, based on my experience and my personal needs: read more.